More than 190 million people have CVI or varicose veins globally.3 More than 30 million Americans suffer from varicose veins, or the more serious form of venous disease called chronic venous insufficiency (CVI), yet the majority remains undiagnosed and untreated.1,2 Varicose veins, a common symptom of venous reflux disease, can affect up to 40 percent of adults.11 Learn more about varicose veins. Healthy leg veins have valves that keep blood flowing to the heart. Venous reflux disease, also known as chronic venous disease, develops when the valves that keep blood flowing out of the legs and back to the heart become damaged or diseased. When the valves stop working properly, they allow blood to flow backward (i.e., reflux) and pool in the lower leg veins. If venous reflux disease is left untreated, symptoms may worsen over time. Once the valves in the leg stop working properly, they cannot be repaired. 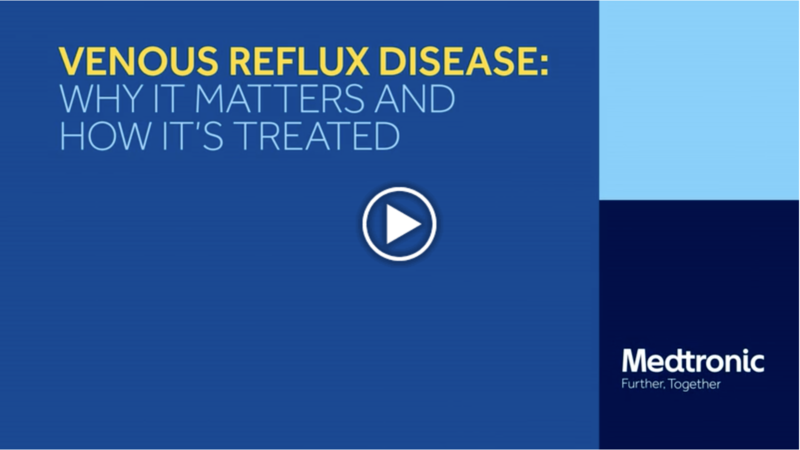 How Is venous reflux disease treated? Venous reflux disease treatment aims to reduce or stop the backward flow of blood. Treating the diseased vein improves overall blood flow and relieves symptoms. For some patients, compression stockings alone may improve blood flow. For other patients, closing or removing the diseased vein may be necessary to improve blood flow. Closing or removing the diseased vein directs blood to nearby healthy veins. Traditionally, surgical stripping or heat-based treatment options are used. However, the VenaSeal™ closure system treats the diseased saphenous veins, without traditional heating or stripping the vein out of the leg. The VenaSeal™ closure system is the only non-thermal, non-tumescent, non-sclerosant procedure approved for use in the U.S. that uses a specially formulated medical adhesive that closes the diseased vein. 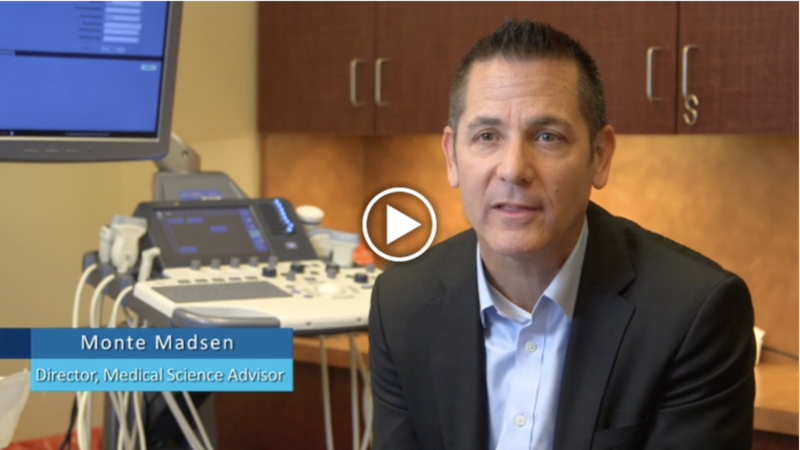 The VenaSeal™ closure system treats symptomatic venous reflux disease in the lower extremity superficial venous system, often the underlying cause of painful varicose veins. During the procedure, a trained clinician fills a syringe with the medical adhesive, which is inserted into a dispensing gun that is attached to a catheter. The catheter is advanced into the diseased vein under ultrasound guidance. The catheter is placed in specific areas along the diseased vein and the clinician conducts a series of trigger pulls to deliver the medical adhesive. Compression is applied to the leg during the procedure. The VenaSeal™ closure system delivers a small amount of specially formulated medical adhesive to the diseased vein. The adhesive closes the vein and blood is rerouted through nearby healthy veins. How does the VenaSeal™ closure system differ from thermal energy procedures? The VenaSeal™ closure system uses an adhesive to close the vein. Thermal energy uses heat to close the vein. Why choose the VenaSeal™ closure system? Is the VenaSeal™ closure system effective? 1 Gloviczki, P, Comerota, A, Dalsing, M, Eklof, B, Gillespie, D, Gloviczki, M, et al. The care of patients with varicose veins and associated chronic venous diseases: Clinical practice guidelines of the Society for Vascular Surgery and the American Venous Forum. J Vasc Surg. 2011 May; 53 (5 Suppl): 2S-48S. 2 US Markets for Varicose Vein Treatment Devices 2011, Millennium Research Group. 2011. 3 Almeida JI, Javier JJ, Mackay E, Bautista C, ProebstleTM. First human use of cyanoacrylate adhesive for treatment of saphenous vein incompetence. Journal of Vascular Surgery: Venous and Lymphatic Disorders 2013;1:174-180. 4 Almeida JI, Javier JJ, Mackay EG, Bautista C, Cher DJ, ProebstleTM. Two-year follow-up of first human use of cyanoacrylate adhesive for treatment of saphenous vein incompetence. Phlebology / Venous Forum of the Royal Society of Medicine 2014. 5 ProebstleTM, Alm J, Dimitri S et al. The European multicenter cohort study on cyanoacrylate embolization of refluxing great saphenous veins. Journal of Vascular Surgery: Venous and Lymphatic Disorders. 6 L. H. Rasmussen, M. Lawaetz, L. Bjoern, B. Vennits, A. Blemings, and B. Eklof, Randomized Clinical Trial Comparing Endovenous Laser Ablation, Radiofrequency Ablation, Foam Sclerotherapy and Surgical Stripping for Great Saphenous Varicose Veins. British Journal of Surgery Society. www.bjs.co.uk, March 15, 2011. 7 Morrison, N. et al. Randomized trial comparing cyanoacrylate embolization and radiofrequency ablation for incompetent great saphenous veins (VeClose). Journal of Vascular Surgery. January 30, 2015. DOI: http://dx.doi.org/10.1016/j.jvs.2014.11.071. 8 Morrison, N. Use of Cyanoacrylate adhesive for Treatment of Incompetent Great Saphenous Veins: 12-month Results of the VeClose Trial, European Venous Forum, 2015. 9 Proebstle, Thomas: The European Multicenter Study on Cyanoacrylate Embolization of Refluxing Great Saphenous Veins without Tumescent Anesthesia and without Compression Therapy – Proebstle, T. eSCOPE three-year data. Charing Cross 2015. 10 Kolluri, Raghu: VenaSealTM Sapheon Closure System vs. Radiofrequency Ablation for Incompetent Great Saphenous Veins (VeClose) Kolluri, R. VeClose two-year data. Charing Cross 2015. 11 Tisi, P. Varicose veins. Clin Evid (Online). 2011. http://www.ncbi.nlm.nih.gov/pubmed/21477400. 12 American College of Phleboloby. Patient FAQs. http://www.phlebology.org/patientinfo/faq.html#varicoseveins. 13 American College of Phleboloby. Treatment of varicose and spider veins. http://phlebology.org/images/resources/ Varicose_Vein_Brochure_Redesign.pdf.14 Pannier F et al. The relevance of the natural history of varicose veins and refunded care.Phlebology 2012; 27 Suppl 1:23-26. 14 Pannier F et al. The relevance of the natural history of varicose veins and refunded care.Phlebology 2012; 27 Suppl 1:23-26. 15 Lui, DM et al., Cyanoacrylate Embolization for the Treatment of Saphenous Vein Reflux: Ultrasound Appearance and Correlative Findings of Comparative Model Histology. ACP 2014. 16 Medtronic. (2014). SapheonTM Closure System Feasibility Study Print Date Final Clinical Study Report, CR-10669-03 (Rev A). Morrisville, NC: Giovino, K.